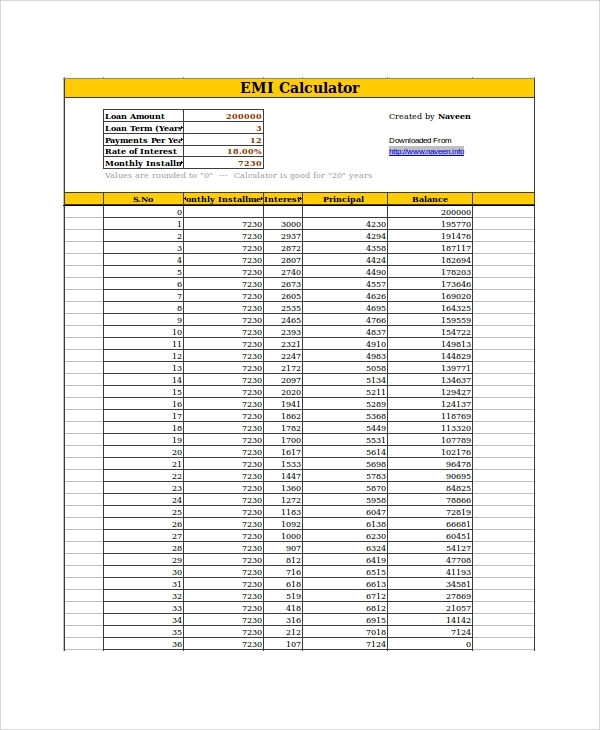 Loan calculators are necessary for every financial institution including banks to calculate quickly the number of installments required for a certain amount of loan depending on the current interest rate. 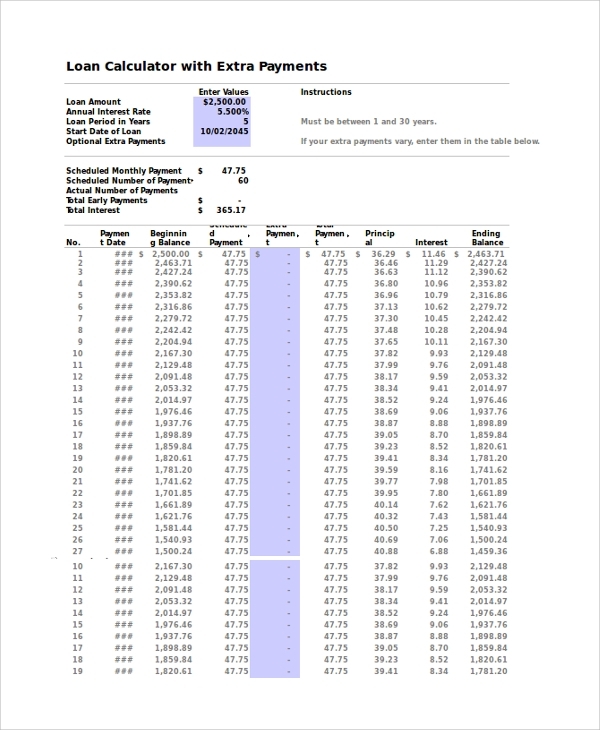 The following Sample Loan Calculator templates in excel allow officials to calculate installments monthly, quarterly, semi-annually and annually as well. They also provide complete details about the installment such as principal amount, interest, beginning and ending balance in a tabular format. The officials can take a print out of that and hand over to the customer for their better understanding of the process. 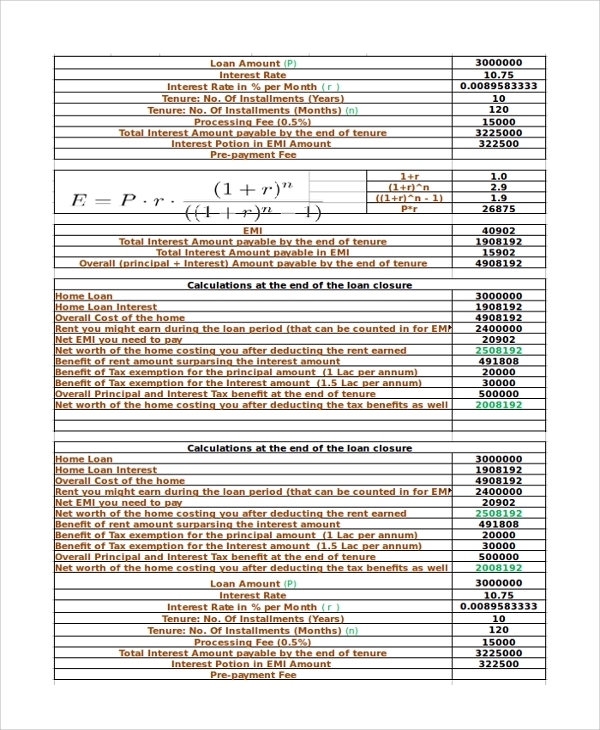 This is a simple loan calculator in excel. It is useful for the calculation of any loan and especially mortgage loan. One has to enter the values of the loan amount, interest rate, loan period, and the monthly payment amount, the number of payments, total interest, and total loan cost will be displayed. Along with that a detailed outlook of each payment with principal and interest amount along with the beginning and ending balance will be displayed in a tabular form which could be given to the customer in a printed format. 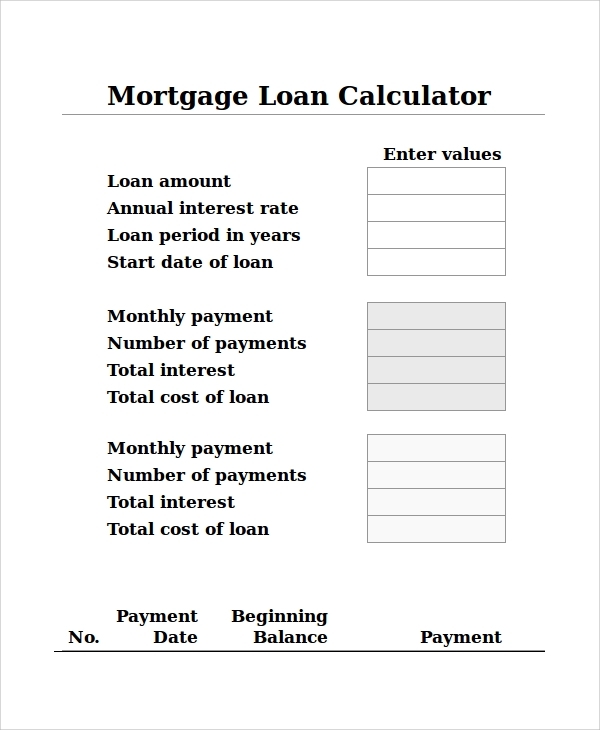 This is a perfect home loan calculator template in excel. Anyone can calculate the installment or EMI, total interest amount payable, number of installments depending upon the tenure of the payment, and the total amount payable and interest payable by the end of the tenure. It helps in the calculation of all the installments with principle and interest in a tabular form and financial companies can give this chart to their customers to have a better understanding of the loan process and make things transparent. This is a complete template for calculating car loans in excel format. One needs to enter all the required details of the car value and the taxes incurred on it to find out the exact amount of loan the customer must take. Then it clearly states the number of payments to be made monthly and the period for such installments depending upon the rate of interest. The frequency of payments can also be changed and the details about each payment are displayed in tabular form for a better understanding. Sample loan calculators are of immense importance for any financial and loan lending company. It can be banks as well as any private financial institution. 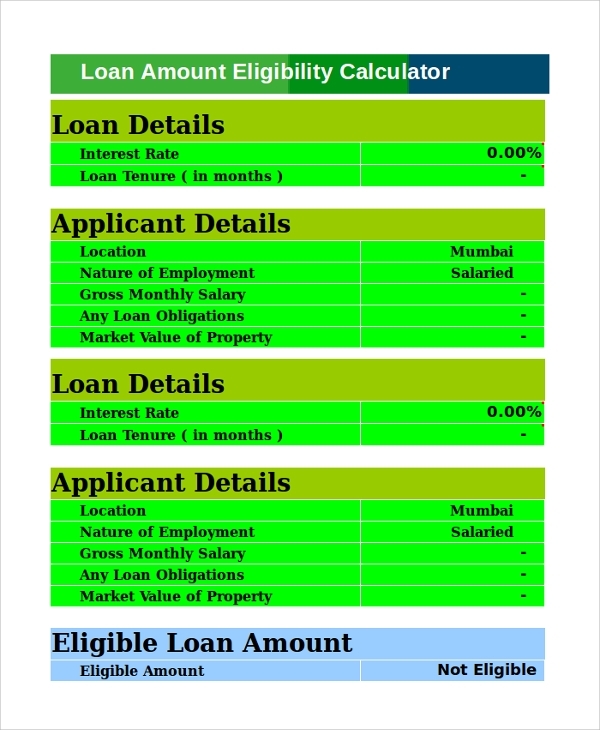 The above-mentioned templates are helpful in calculating any loan, be it a mortgage, property, car and anything else. Only a few necessary data has to be entered to get the complete details about the installments in the most lucid form which even the customers can understand. They make the process easy and transparent. 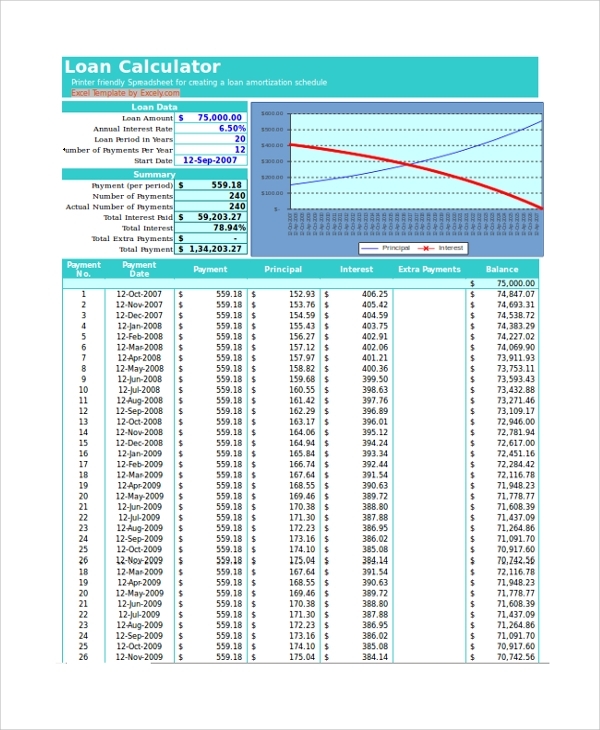 Such loan calculators are present in excel format and everyone knows how to use excel. Only a few data needs to be entered which anyone can enter and get complete details which everyone can understand. Thus, such templates are made for common people to understand and operate. These templates make the process easy, fast and transparent. The customers can understand how much amount they have to pay in advance and they can save money accordingly form their Monthly Budget Calculator. They will also understand the process of loan repaying better than ever. 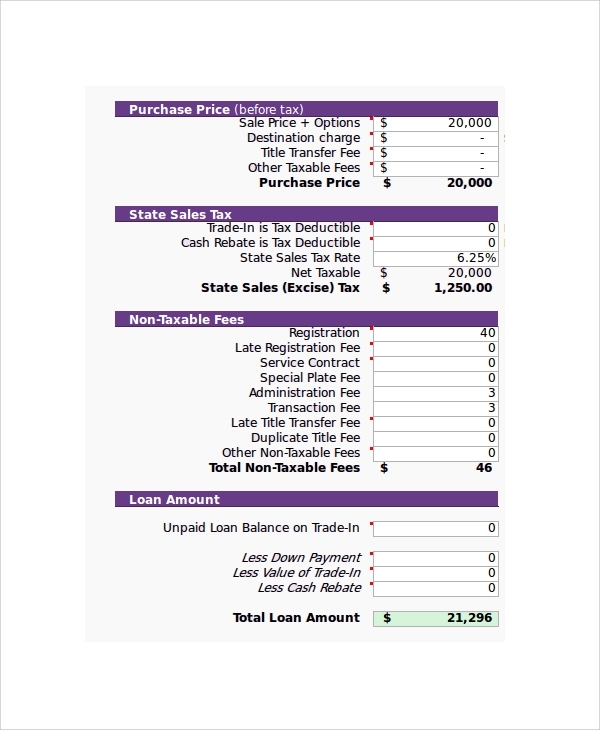 The above-listed sample loan calculator templates are tailor-made for calculation of loan details and its installment in lightening fast mode. Only a few data has to be entered and the rest will be presented in the most understandable format. It helps in easy calculation of complicated things and makes the entire process transparent for the customer to understand. Customers can form their monthly budget according to the installment to repay the loan in time.